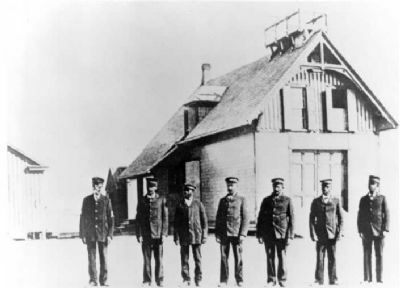 Located south of Oregon Inlet, Lifesaving Station Pea Island was the only unit in the history of the Coast Guard manned by all Black crews. 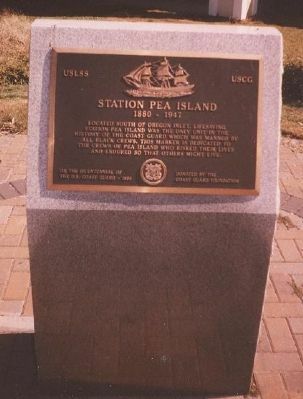 This marker is dedicated to the crews of Pea Island who risked their lives and endured so that others might live. Erected 1999 by The Coast Guard Association, on the Bicentennial of the US Coast Guard. Location. 35° 54.519′ N, 75° 40.173′ W. Marker is in Manteo, North Carolina, in Dare County. Marker can be reached from Fernando Street. Touch for map. Marker is in the courtyard of the North Carolina Aquarium (formerly, the North Carolina Maritime Museum), Roanoke Island. Marker is at or near this postal address: 106 Fernando Street, Manteo NC 27954, United States of America. Touch for directions. Black surfmen of the Life Saving Service pose with the station's first Black keeper, North Carolina waterman and Civil War U.S. Army veteran, "Captain" Richard Etheridge. (about 400 feet away, measured in a direct line); Confederate Channel Obstructions (approx. 0.3 miles away); Fort Bartow (approx. 0.3 miles away); Andrew Cartwright (approx. 1.3 miles away); Battle of Roanoke Island (approx. 1.4 miles away). Touch for a list and map of all markers in Manteo. Regarding USLSS/USCG Station Pea Island Memorial. The exploits of the Black life savers were legendary, but it was not until 1992 that those on duty in 1896 were finally awarded the Coast Guard Gold Medal (the service's highest decoration) for their particularly dramatic rescue of survivors stranded aboard the wrecked schooner, E.S. Newman on October 11, 1896. Related marker. Click here for another marker that is related to this marker. To better understand the relationship, study each marker in the order shown. 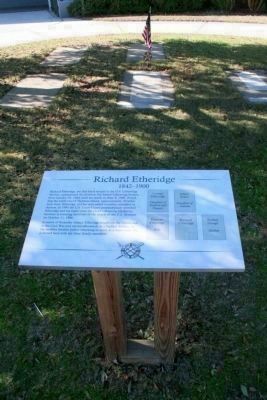 at the Etheridge Family burial plot which, like the USLSS/USCG Station Pea Island Memorial is located on the grounds of the North Carolina Aquarium on Roanoke Island. 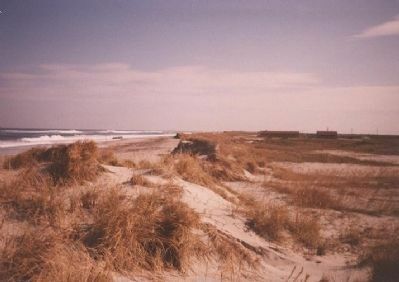 Island; Fire on the Beach; Station Pea Island Memorial; Reconstruction; Jim Crow. More. Search the internet for USLSS/USCG Station Pea Island Memorial. Credits. This page was last revised on June 16, 2016. This page originally submitted on January 7, 2008, by Richard E. Miller of Oxon Hill, Maryland. This page has been viewed 2,282 times since then and 20 times this year. Last updated on October 22, 2011, by Richard E. Miller of Oxon Hill, Maryland. Photos: 1, 2, 3. submitted on January 7, 2008, by Richard E. Miller of Oxon Hill, Maryland. 4. submitted on October 22, 2011, by Richard E. Miller of Oxon Hill, Maryland. • Craig Swain was the editor who published this page.